My husband Jim and I had no idea our second Brittany bird dog would be our ticket into an entire dog world in Maine. We quickly learned about kennel clubs, breed clubs for specific breeds of dogs, hunting retriever and bird dog clubs, hunting hound dogs, specialty dogs such as search and rescue, cadaver and drug dogs, and dozens of dog rescue groups in Maine. We also became acquainted with the statewide Federation of Maine Dog Clubs and Responsible Dog Owners, which, among other functions, monitors dog-related legislation in Augusta and Washington, maintains breeder and rescue directories, and offers information on being a responsible dog owner. Dog clubs pay dues to be members of the federation. And the kennel clubs, which are regional, put on dog sporting events such as agility trials, obedience trials, rally-obedience trials, and conformation shows. There also are specialty teams such as Flyball MAINEiacs, of which I am a member (think dog relay-racing), dog sledders and herding groups. Dozens of sporting camps and guide services use trained dogs for guided hunts in Maine’s woods, and there are professional trainers who prepare the dogs for those roles. Individuals also can hire a professional trainer in Maine, and hunt with the trained dog in one of the state’s many wildlife management districts. There is lots of public land. All of this dog diversity in Maine means there is a huge pool of dog knowledge in the state, and people who like to share it. So if you are just starting out hunting birds with dogs, there are groups and individuals you can turn to for advice — from the best place to obtain the bird dog breed you want to the finer points of training that dog. The best place to start is with a quality breeder. Regional kennel clubs or breed clubs can make breeder recommendations to you. Any breeders worth their salt can help you choose the right dog for you, advise you on basic training and direct you to individuals or groups that are competent to help you with the rest. Joining a breed club or a hunting club or organization that specializes in hunting dogs is another way to meet experienced people who can provide direction. My husband and I joined Central Maine Brittany Club, whose New England-wide membership was — and still is — a combination of experienced and amateur Brittany people who compete in bird dog hunting competitions and hunt with their dogs during bird season. Experienced Brittany owners who compete in hunting competitions also may have knowledge of other breeds of bird dogs and compare and contrast them for you. Associations such as these are contact points for becoming part of the dog world, which has its own communication network and culture, and can connect you to resources you couldn’t imagine. 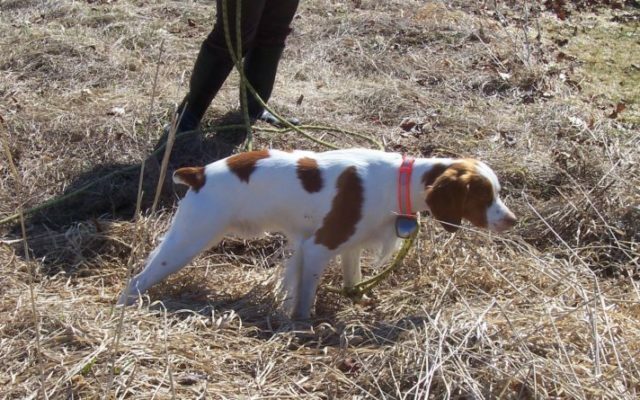 Jim and I hunted with our first Brittany dog Rosie, but she was not formally trained. She just had a lot of natural instinct and we took advantage of it. Our second Brittany, Sassy, had some training but she was quite independent. We read training books and watched free videos from American Kennel Club and others we purchased from Gun Dog Supply. We went to trainings put on by the Brittany club, talked to North American Versatile Hunting Dog Association representatives at demonstrations at sportsmen shows, and sought individual advice from our breeder and other club members. Bullet has turned out to be an awesome bird dog. He has earned hunting titles and obtained points in field competitions and, at 10 years old, remains my top hunting dog during bird season. He’s also a great year-round companion. After hours and hours of research, reading, trainings, talking with experienced and professional people, exercising patience and persistence, and tons of trial and error, I feel confident about the elements of basic bird dog training and even some of the intermediate level skills. And my associations with other aspects of Maine’s dog culture have schooled me on ethical treatment, feeding, housing, grooming, exercising and general care of my dogs. The combined experience has given me a well-rounded education, and has filled my training toolbox with lots of good knowledge. Of course, even with this knowledge, every dog is different — and can have traits that fly in the face of the dog training manuals. Just as the process of dog training never ends, training the amateur bird dog trainer never ends either, because there is always another challenge — such as teaching my 4-year-old Brittany Quincy to retrieve dead birds. But we’ve already talked about that. Julie Murchison Harris is community editor at Bangor Daily News. She is widowed and shares her life with three Brittanys — Sassy, 12, Bullet, 10, and Quincy, 4 — in an old farmhouse in Hermon.